My machine is amazing. And it is a dream. Recently proven to me as a matter of fact when I quilted a baby quilt last week. I kept it simple, using the included walking foot to stitch straight lines fairly close to each other. Not a problem. I didn’t break any thread and I didn’t curse my machine. Oh, and it quilted up in record time because my machine sews at like 1600 stitches per minute. Crazy fast! Straight line quilting was easy. That was most definitely not the case while stitching the zig zags on the quilt I’m making for my mom. To be honest, I don’t think its the machine’s fault. I’m going to blame the thread – Aurifil 50wt Cotton Mako. Its just too thin. And way too linty! I’ve read some thread reviews on pattern review and on some quilter’s message boards and I’ve come to the conclusion that I should use polyester thread with my Juki. Thicker cotton thread might work, but I still feel that the lint will be a major problem. While quilting the other day, I ended up taking the throat plate off midway through to clean the lint from the bobbin case area. The Supreme Slider and the Machingers did make a world of difference. 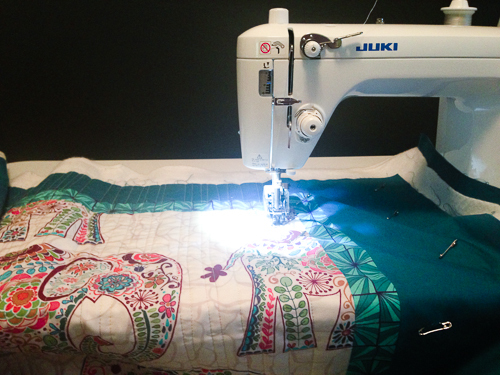 The slider allowed the quilt to move freely across the machine and the gloves helped me grip all that fabric. Despite the thread issues, the quilting looks pretty good. The stitches are even, the tension is perfect and there are no fabric puckers. I am definitely happy that I bought this machine. I have a Juki too! I haven’t been having thread issues. Maybe it was even a bad spool. I have had that before on another machine.